Well, if Epi could see the room now, he wouldn’t recognise it. 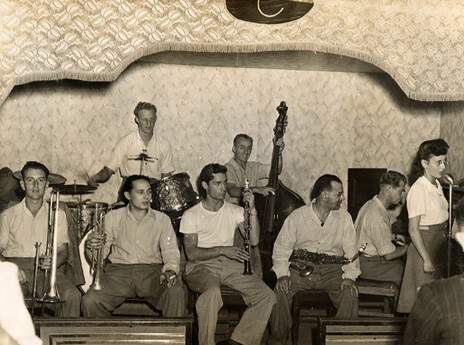 The old room, which had seen a passing parade of the country’s finest jazz and dance musicians – as well as being a meeting place for couples – is now a recording studio. 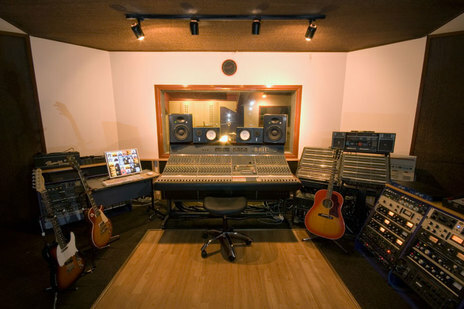 It is The Lab, run by sound engineer Olly Harmer, who took over the space in 2001. Between the end of the dancehall days and his occupancy the space had been a recording studio and rehearsal room, a photographer’s studio, and then a recording studio again named The Lab. This was run by Bungalow Bill, who moved The Lab from Symonds St into this once-cavernous space, now divided into separate studios. It had stood empty for a period and Harmer laughs when he recalls the rats and piled-up junk he first encountered. Today, under Harmer, the old ballroom houses seven musicians who sub-lease rooms, there’s a kitchen, workplaces along the old mezzanine and – where those dance bands once stood – is a small studio for electro-pop producer Alistair Deverick, who has drummed with Lawrence Arabia and Neil Finn, and performs as Boycrush. In a 2015 profile in the New Zealand Herald, Deverick described his tiny room as his “second home” and noted that his grandmother came to dances down the long stairs when it was a ballroom. Yes, once it was all very different down here. The cinema above – which opened in the late 1920s (some say 1928, others the following year) – was one of Auckland’s great drawcards in those more elegant days when people got dressed up to go the movies. It became the first suburban cinema to feature talkies when it screened Frank Capra’s film The Donovan Affair in August 1929, and regular screenings continued until the mid-1990s. In 2014, the cinema was revived as a live venue, and the following year a short documentary about the venue, Please Open, was directed by Karl Sheridan and Robin Gee. Hollie Smith was the first musician to play the upstairs room, which soon played host to Liam Finn, Connan Mockasin, Lawrence Arabia and many others. it was the huge space downstairs where the musical action happened. But, in the heyday of the Crystal Palace, it was the huge space downstairs where the musical action happened: the Crystal Palace Ballroom. It was there that people met their spouses, dozens of musicians played and made their reputations, and where Shalfoon lived and died, literally in the case of the latter. Shalfoon helmed the Melody Boys band there from 1935 and in his various line-ups he had the cream of the country’s talent: Frank Gibson Sr, Lew Campbell, Bob Ewing, Eric Foley, Spike Donovan, Bill Egerton, Jim Warren, Nolan Rafferty … all names known to subsequent generations of jazz musicians. Shalfoon himself was as colourful as his name suggests: He was born Gareeb Shalfoon to a Syrian father and Māori mother in Opotiki, taught himself sax and clarinet while learning piano and at 20 had his own band and was ready to hit the brighter lights. It took him a little more than a decade – sidetracked by playing around Waikato/Bay of Plenty, building a reputation as an entertainer as much as a musician (tellingly his nickname was Chuckles) – but in 1935 he got the Saturday night residency at the Crystal Palace Ballroom. He and his bands with revolving-door membership stayed there for 18 years, their shows were recorded, sweat would drip off the walls – the ceiling near the stage is low because of the sloping theatre floor upstairs – and his daughter Reo became local sensation as a singer. Her 1951 recording of ‘All Dressed Up To Smile’ might have been the theme for those generations during the war and the years after. Shalfoon was in ill-health by then and, one night in 1953, Reo invited her father back to ballroom he had made famous and, while dancing with her on that wooden floor which is still there today, he collapsed and died. He was just 48. 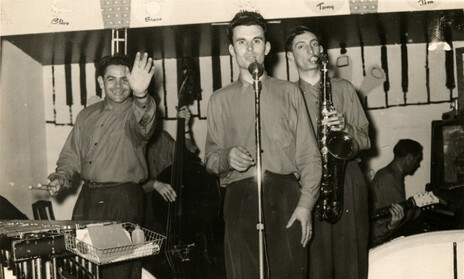 After Epi’s departure and death, the Crystal Palace Ballroom struggled until 1958 when the personable trombonist, entertainer and natural wit Merv Thomas brought in his Dixielanders for a residency of almost five years. To hear MERV Thomas tell of those nights at the Crystal Palace is to be transported to a different time. “The main influence in that band was Clive Laurent who had come back from the States. He wasn’t a great trumpet player, but he was a great showman. And he wasn’t a great vibraphone player, but again, a great showman. “We used to do a feature I’d heard on a Dizzy Gillespie record and I thought would be a great act for Clive. We’d do a floor show at supper time so I went on the microphone and said, ‘Ladies and gentlemen, we are privileged tonight to have one of the world’s greatest vibraphone players and he’s here especially for you’. I’d go on and on, I’d use every adjective you could think of, ‘And so please welcome … Clive Laurent’. And he would come out with this beautiful rubber ape mask. 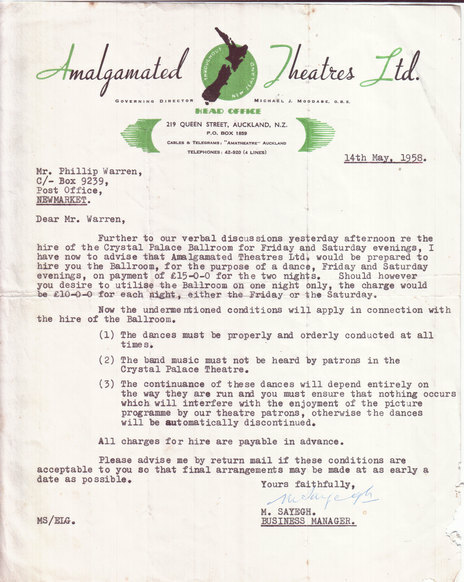 There was proper coffee – advertised as “American ‘Perk’ Coffee for your comfort and stimulation” – and illicit alcohol (some smuggled in, some as an additive to the coffee) and Warren astutely promoted the ballroom. Thomas remembers they had to put the “House Full” sign outside to stop people coming in. But Thomas also built amplifiers for the band, and most notably the tape recorder and stereo mixer on which Johnny Devlin first recorded. And that – unbeknownst to the jazz musicians at the Crystal Palace – was the beginning of the end. The bands played on and even lasted into the Beatles’ era of the early 1960s when stars such as the glamorous Marlene Tong performed (before being busted for marijuana in 1964 and departing for Australia). 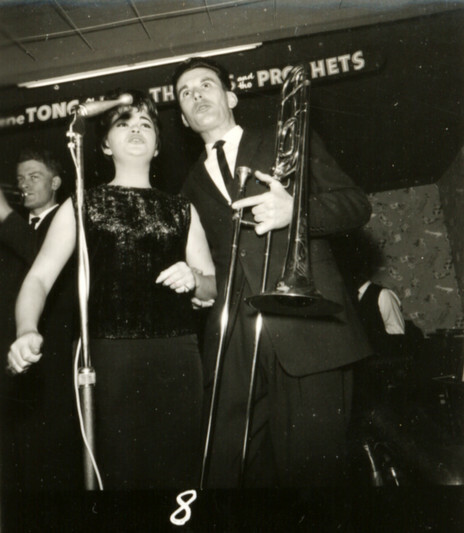 With the Dixielanders renamed The Prophets, Thomas and Tong specialised in an energetic tribute to Louis Prima and Keely Smith's Las Vegas act. By the mid-60s the whole dynamic of entertainment had changed and although the Crystal Palace and the Orange Ballroom (where Bill Sevesi maintained a residency) struggled on, the crowds diminished. The times had a-changed and those couples who’d met on the dancefloor were now living in the suburbs and raising children. 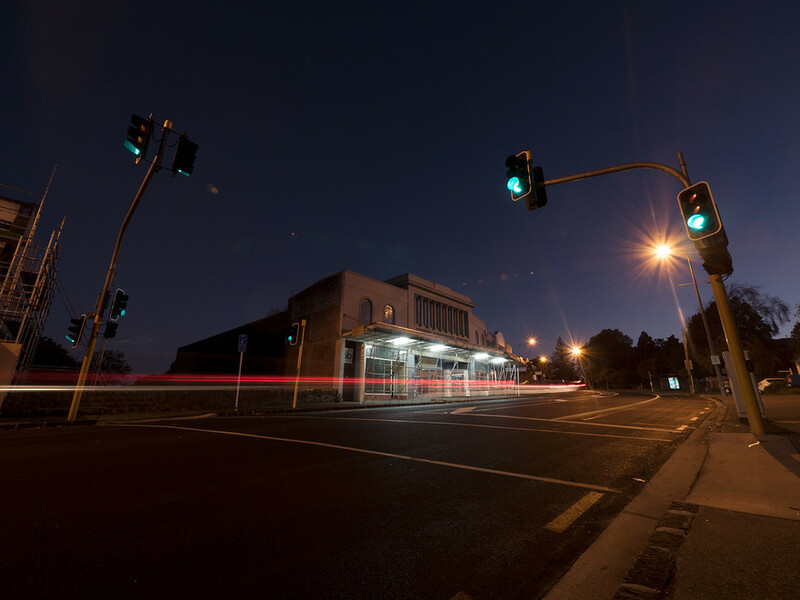 Phil Warren applied his entrepreneurial skills to selling the new sounds to the next generation – in 1964, for example, he opened the Beatle Inn near lower Queen Street – and the old dancehalls suffered. And places like the Crystal Palace Ballroom eventually had to shut their doors. Today we might wonder what if, “Epi Could See It Now”? Please Open, the documentary above, was directed by Karl Sheridan and Robin Gee, and produced by Monster Valley. It is included in the Loading Docs series of short documentaries. The photo below of the Crystal Palace in 2015 is provided by Monster Valley.